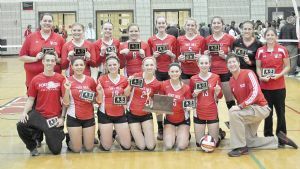 On November 16, 2013, Fort Hill became the second Allegany County high school to capture the Maryland State Women's Volleyball Championship. Fort Hill completed a perfect undefeated 19-0 season in College Park by defeating a school from Baltimore County for the 1A title. Mt. Savage High School has won the State Girls Volleyball Championship four times, these being in 1979, 1982, 1983 and 1997. It should be noted that Fort Hill High School also won state volleyball championships in 1950, 1953, and 1954. However, based upon information supplied to us by Mike Mathews of the Cumberland Times-News, this was prior to the first Maryland Public Secondary School Athletic Association (MPSSAA) state sanctioned volleyball tournament in 1975. The earlier game was somewhat different from the volleyball we know today, with nine players on each side and no spiking. Both Allegany and Fort Hill High Schools have banners indicating several State (Women's) Volleyball Championships from the 1930s. Members of the Fort Hill Sentinels team depicted in the photo are, front row left to right, assistant coach Taylor Anderson, Troie York, Haley Wolfe, Rachel Alderton, Erin Amoruso, Moriah King and head coach Joey Brewer. Standing, left to right, are assistant coach Becky Miller, Skylar Barbe, Sydney Ibarra, Danielle Hershiser, Maddi Stepp, Sarah Lowery, Sierra Minnick and assistant coach Lindsey Fisher.